How nice during a holiday in nature to enjoy a slice of fragrant shish kebab. Juicy meat with the smell of smoke tempts and awakens the appetite. To abandon him is impossible. Is it possible to cook this dish is not only pork and lamb? Is it possible to use for the preparation of dietary meat chicken or Turkey? The meat for the barbecue doesn't have to be pork or lamb. A wonderful alternative to it could be the Turkey. This home bird is fat enough. So the pieces of shish kebab from the Turkey will be juicy and tender. It should be remembered that part of the sirloin, the Turkey more juicy, the brisket is dry. Therefore, for each of these parts require different ways of marinade. Washed Turkey meat separated from the bones and cut into portions for the barbecue. Onion cut into large rings. Basil is pulverized. In a small bowl, prepare the sauce for the marinade. To do this, squeeze the juice of one lemon, add salt, ground black pepper, chopped Basil, and rosemary. All mixed together. In a pan to marinate meat put a layer of onion rings. Then each piece of meat dipped in the marinade and lightly RUB in the spices. Put in layers in a pan on top of onions. Each layer of meat on top of onions draped. Alternate layers until all products. All poured on top of the remains of the marinade. In this state, the meat should be left for 8-10 hours. If you want you can start frying before, but a longer marinating will allow the meat to fry faster and be more tasty. The fry in any way: on the grill, in the set or just the frying pan. - tomatoes (fresh) – 6-7 pieces. Turkey meat can be replaced with chicken, taking the same part. In this case, the barbecue will take less time, as the chicken is not so hard. Breast cut into pieces for barbecue. Spread in the pan in layers alternating with onions. Pour mayonnaise. If desired, mix well. Leave to marinate for 5-6 hours. Ready marinated pieces strung on a skewer, alternating with circles of fresh tomatoes and onions. Fry any suggested above. 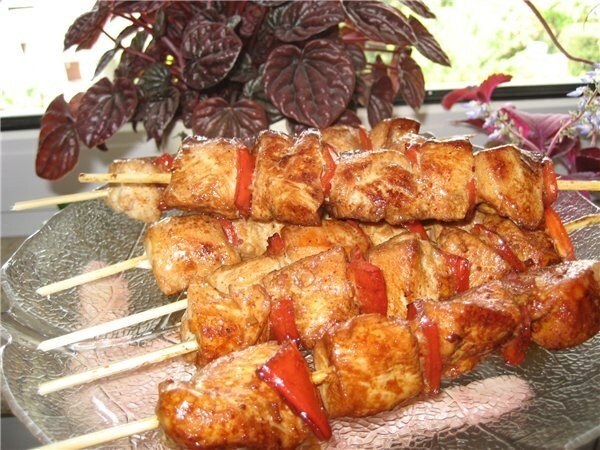 Ready kebabs should be soft, juicy and well otkazyvatsya. The marinade can replace fat yogurt or sour milk. In this case the meat will be more soft because of the special properties of these products. Fried pieces can be served hot, after removing them from the skewers and sprinkled with fresh herbs. At a picnic if you wish, grill your favourite food directly from the skewer, carefully removing one piece. So this dish appears more appetizing. It is possible to apply recommend a dry red wine.